Unlimited 1% cash back on gas and grocery purchases, automatic credit line increase reviews, free monthly credit score tracking, fraud liability. 17.90% to 23.90%. Variable based on the market Prime Rate. $5 or 8% of the amount of each cash advance, whichever is greater. I have had the card for about 6 months now. I knew the initial fee and the annual fee and the interest rate and agreed to all. 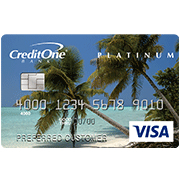 The sums are high, but then this is a card for establishing or increasing your credit score. It is not really designed for everyday use although I am sure they love to see it. I have had no problems. I have not needed to contact CS so I cannot comment on that but I have not had any surprises and have paid my bills on-time while carrying about an 80% balance to my $350 limit. They have reported promptly to the credit bureaus. I think for my above stated purpose, this card is fine. Within a couple of more months, my credit score should be up enough to get a real card and dump this one, but I have been glad to have it.